A new number one and a new all-star team, Runaways is set to come back with a vengeance. The second Marvel comic book to have the amazing Terry Moore (Strangers in Paradise) scribbling for it this month, Runaways combines some old fashioned action-adventure with quick humour and teen drama for one stellar read. Terry Moore is having fun with this book, it shines through already as he keeps the story away from any dead spots whatsoever. But his fun is also grounded in a studied look at how Runaways works and why it is successful as he echoes original writer Brian K. Vaughan’s quick humour style. The book has everything and I was reminded of the first few arcs of the series reading this. The kids are back in LA again, away from the needless interference of the other heroes, and doing things other heroes don’t seem to have to worry about; finding an income, a place to be squatters, and keep from being noticed, and it seems two out of three ain’t bad. But Terry Moore has really done his homework and his characterization is spot on. 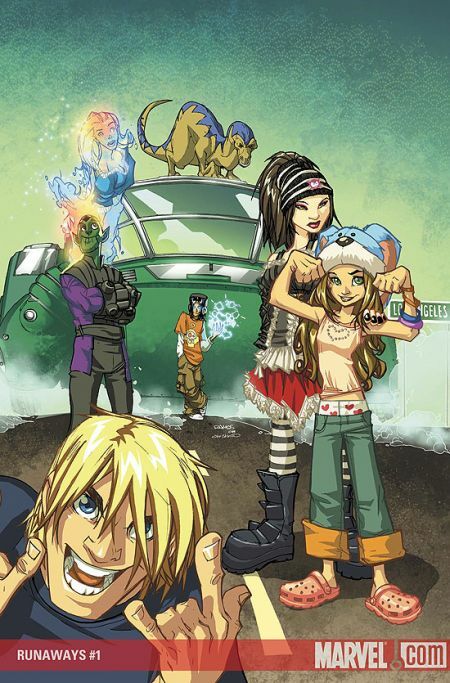 Each of the Runaways maintains their personalities. His big moment to use Molly didn’t really pan out, but I’m more than confident Moore will make full use of her out of the mouth of babes lines. Chase seems past his dark and moody grieving phase, which is nice and jarring at the same time considering the previous arc, written by Joss Whedon, had an emphasis on the late Gert. But he is back to his lovable and stupid self. Now will also be a chance to see how someone handles the newest edition to the Runaways, Klara, whom they brought back from the past. She is a fish out of water, but Moore chooses to not focus on her acclimatization, but uses her for commenting on the world around us. Her and Molly will be a great duo in this series and something positive to take from Whedon’s otherwise over hyped and unimpressive run. Runaways is on its A game once again. As for the art, if you like the cover, you’ll love what’s inside. If you’re like me and hate the cover, then it only gets worse from there. The characters are far too like a children’s cartoon. It’s like Skottie Young’s art in past New X-Men issues without the cool stylization. It just strikes me the wrong way and I find it frustrating. Yes, Runaways is a fun book, packed with humour and action, but it also is not campy, which is exactly what penciller Humberto Ramos is doing. Also, some of the characters are almost unrecognizable while others, Chase and Victor particularly, look the exact same with slightly different skin and hair colour. Molly and Klara also look like bobble-heads. But it is really a qustion of preference, and I prefer someone else. Runaways has always had amazing art, from Adrian Alphona to Michael Ryan, so this is the first time I am disappointed with the pencilling for this series. 7/10 Amazing story, funny with great characterization. Art is over the top to say the least.